At least 13 people have been injured after a man drove a car into a busy nightclub. Police were called at 23:47 GMT on Saturday after a Suzuki Vitara drove into Blake's in Gravesend, Kent. It is believed the driver had been asked to leave the club in Queen Street after an earlier altercation. A witness has described "a complete mess of panic and chaos". A 21-year-old man has been arrested on suspicion of attempted murder. Kent Police said several of those hurt have suffered broken bones. As well as the 13 confirmed injured, officers believe several others may have left the scene. Seven people were taken to hospital, four with minor injuries and three with serious but not life-threatening injuries, the ambulance service added. Police said the driver of the vehicle suffered minor injuries and was taken to hospital as a precaution but is currently in custody. Det Ch Insp David Chewter said: "This was a frightening experience for everyone involved and it is a miracle that nobody was killed." Witnesses said a 4x4 had been driven into a tented area full of people. It is believed the car drove along an alleyway alongside the club before crashing into it. Chloe Germaney, 18, said she heard a "massive bang" before seeing the 4x4 "driving into the club through the gates into the lounge, running people over". She said security shouted for people to run, adding: "Everyone ran for their lives back into the club, we got locked in, nobody knew what was going on. "At that point I text my loved ones saying I've been in an incident and that I love them because I thought I wasn't going to make it out alive." Ms Germaney said she has had flashbacks and "feels so paranoid I can't even step outside". 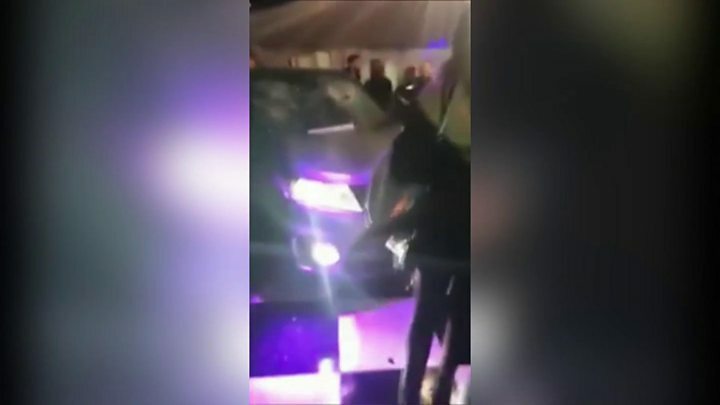 Footage posted on social media appeared to show a car inside a tented area with people being led to safety by police. BBC Radio 1Xtra DJ Reece Parkinson, who was in the club at the time, told BBC Newsbeat he initially thought it was a terror attack. He said: "We heard screaming, turned around and saw a big 4x4 come in the room. "We ran to the back and I was waiting to hear bullets or something, but thank God there wasn't. "As soon as he [car driver] stopped people were throwing stuff at the car, they dragged him out, people were hitting him. He looked unconscious." Three police cars, two from the forensic investigation team, are parked outside Blake's nightclub this morning. Staff from the club occasionally come outside, still appearing to be visibly shocked. Two broken wing mirrors lie in an alleyway between the club and the market next-door which is cordoned off. A tent at the far end of the alleyway is too far away to see the damage clearly. Jade Keepin, 18, said she saw a "car in the middle of the floor that security had surrounded". "I saw a person smash the back window of the car with his elbow and people began throwing stuff at the car. It was manic." Sonny Powar said he saw two people get hit by the car before the driver was pulled from the vehicle. "[A man] drove his 4x4 into the tent we was all in and ran people over, it stopped at my feet so any further and I could have died. Then he reversed up and we all ran," he added. In a statement, Blake's nightclub thanked the "heroic actions" of door staff and guests who it said apprehended the man "before further harm was caused". The club said it was "deeply saddened that injuries occurred" but was "grateful that no-one was fatally hurt". It added: "We strive to create a safe and positive environment for all. Last night however, the unpredictable actions of one individual ruined a great occasion for all." Gravesham Borough Council praised the response of the emergency services in a tweet. Kent Fire and Rescue Service and five South East Coast Ambulance Service crews also attended the scene. Det Ch Insp Chewter said: "We believe there are likely to be further casualties who perhaps left the club during the panic and we would like to hear from them." He also urged anyone who was in the club at the time or anyone with photos or original video footage to get in touch. Kent Police said it was not being treated as a terror-related incident.